Japanese companies doing business in Pakistan have ranked the country second in the world in terms of business growth, according to a survey conducted by the Japan External Trade Organization (JETRO). JETRO surveyed 9,371 Japanese multinational companies operating around the world and reported that Pakistan is ranked number 2 in terms of current profitability and expected sales growth. Taiwan leads with 81.8% reporting profits, followed by Pakistan with 74.1% being profitable in 2013. Pakistan also ranks at number 2 with 81.5% forecasting future sales growth, just behind Myanmar where 84.6% see growth in the next one to two years. Other South Asian nations, including Bangladesh, India and Sri Lanka, rank much lower for both profits and sales growth. JETRO has been conducting such surveys for many years. Pakistan’s data is based on responses of 27 Japanese firms doing business in the country. The percentage of Japanese firms expecting improved operating profits remained the same level as last year, while varying by country and region. 64.6% of respondents expect an operating profit in 2013, remaining almost the same level as the previous year (63.9%). 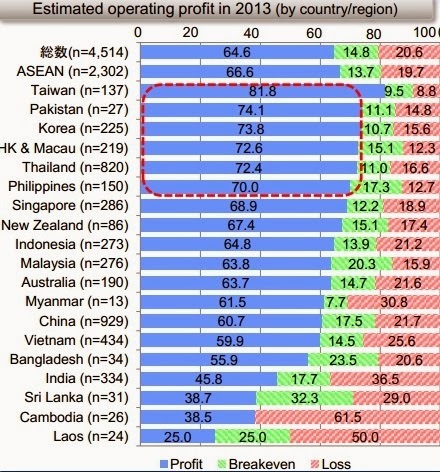 Looking at the results by country, the percentage for Taiwan is the highest (81.8%), followed by Pakistan (74.1%), South Korea (73.8%), Hong Kong and Macau (72.6%) and Thailand (72.4%), among others. 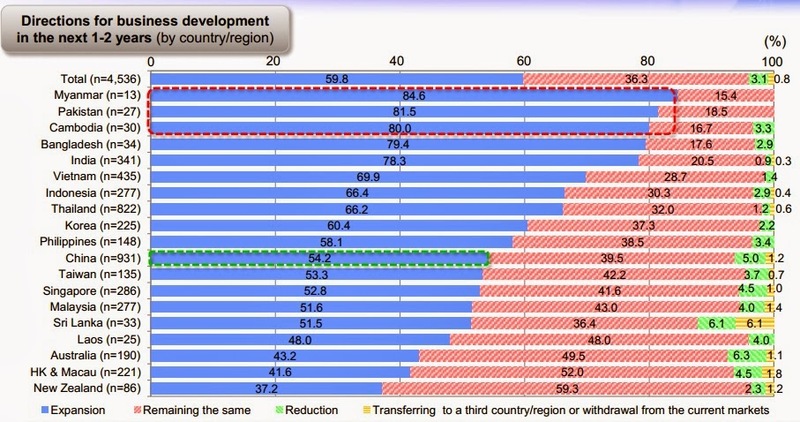 On the other hand, the percentage is relatively low for Sri Lanka (38.7%), Cambodia (38.5%) and Laos (25.0%). Looking at the results by business scale, 69.4% of large-scale companies expect an operating profit, 13.2 points above the percentage for small and medium-sized enterprises (SMEs) (56.2%). The percentage of respondents planning to expand business operations in the next one or two years was 59.8% overall, a 2.0 point rise from the 57.8% in the previous year. Firms in emerging countries such as Myanmar (84.6%), Pakistan (81.5%) and Cambodia (80.0%) have particularly strong intentions to expand their business for the reasons of “sales increase” and “high growth potential.” The percentage for China increased to 54.2%, a 1.9 point rise from 2012 when it had decreased by 14.5 points from 2011. On the other hand, the percentage for Indonesia decreased 10.9 points from the previous year, the largest decrease among the surveyed countries. While the percentages for the Philippines (58.1%) and Sri Lanka (51.5%) are below overall average, they showed significant increase (9.9 points and 14.0 points, respectively) compared to the previous year. JETRO survey is the latest ray hope on the heels of impressive share market performance in 2013. Karachi's KSE-100 Stock Market Index was up 49.4% (37% in US$ terms) in 2013, beating all but four stock indices in the world. It handily beat Morgan Stanley's MSCI emerging market index which remained essentially flat. By comparison, India's main stock index rose just 8.89% in the same period. The remaining three BRIC countries--Brazil, Russia and China-- all saw their key stock indices decline in 2013. This is a continuation of the bullish trend seen in 2012 when KSE-100 also rose nearly 50% to top all Asian market indices. 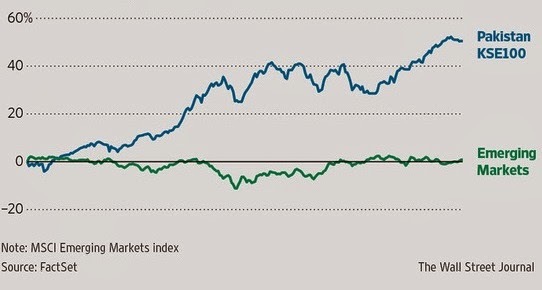 As of December 31, 2013, KSE-100 is up 329% since the end of 2008. It is being driven mainly by rapid growth in revenue and profits of the listed companies. Even after the strong run-up, the market still remains cheap—currently trading at over nine times trailing 12 month earnings—a common valuation measure used by stock analysts, according to Wall Street Journal. Dubai finished up the most in 2013 with a gain of 107.69%. Japan was up the fourth most with a gain of 56.72%, making it the best performing G7 country. The US ended up in 9th place globally with a gain of 29.6%. Of the other G7 countries, Germany finished third with a YTD gain of 25.48%, followed by France (17.99%), Italy (16.56%), the UK (14.43%) and Canada (9.55%), according to Seeking Alpha. The fresh investor optimism in 2013 was triggered by the election of Prime Minister Nawaz Sharif whose government is seen to be business-friendly by investors and businessmen. His finance minister Ishaq Dar claimed that Pakistan's gdp growth accelerated to 5% in July-Sept quarter in 2013. It was driven by large-scale manufacturing (LSM) which grew 12.76 per cent in September 2013 from a year ago. "Pakistan has a fairly diverse economy with a large and young population that needs to be fed and supplied basic infrastructure such as electricity," Wall Street Journal quoted Caglar Somek, global portfolio manager at Caravel Management in New York, as saying. He manages around $650 million of investments. "If you find the companies that supply those basic needs, growing at double digit with high profitability, you can buy them at valuations that are on average 30% to 40% cheaper than their emerging market peers," said Mr. Somek. Since the general elections of May, 2013, Pakistan has seen smooth power transfer from one civilian government to another. Other major transitions include the change of President, Army Chief and the nation's powerful Chief Justice of the Supreme Court. Power cuts are now less frequent after payment of power generation companies overdue bills by the federal government. Financing has been closed on several power projects, including ADB financing of a major coal-fired plant in Jamshoro and Chinese loans for the nation's largest nuclear power plant planned for Karachi. The good news for Pakistan in the JETRO report is that the Japanese companies have "strong intentions to expand their business for the reasons of “sales increase” and “high growth potential.”" Let's hope this results in a significant increase in foreign direct investment (FDI) in the country. Progress on economic front, however, needs to be matched by similar progress on the security front which remains the biggest concern for the future of the country and its economy. What is needed is a comprehensive anti-terrorism strategy and plan of action soon. usually high profits are often signs of cartelized uncompetetive markets. In the Indian auto industry for example you have something like 30 car manufacturers and margins are razor thin due to competition. Pakistan my understanding is excluding the luxury car imports most autos are licence built toyotas and suzukis by local manufacturers who ave effectively cartelized the market. Anon: "Pakistan my understanding is excluding the luxury car imports most autos are licence built toyotas and suzukis by local manufacturers who ave effectively cartelized the market." JETRO survey shows both top line and bottom line growth of Japanese multinationals in Pakistan. Cartels may help profitability but have no positive impact on top line growth. Growth comes from demand, not cartelization. majumdar: " I see that you have not posted your musings on the UNESCO EFA and UNICEF reports for 2014 which are just out." First, this post has nothing to do with UNESCO. It's about Japanese business in Pakistan. Second, there's nothing new in UNESCO report that has not already been discussed in my multiple recent posts on the poor state of human development in Pakistan. In addition to the economic revival, Musharraf focused on social sector as well. Pakistan's HDI grew an average rate of 2.7% per year under President Musharraf from 2000 to 2007, and then its pace slowed to 0.7% per year in 2008 to 2012 under elected politicians, according to the 2013 Human Development Report titled “The Rise of the South: Human Progress in a Diverse World”. Overall, Pakistan's human development score rose by 18.9% during Musharraf years and increased just 3.4% under elected leadership since 2008. The news on the human development front got even worse in the last three years, with HDI growth slowing down as low as 0.59% — a paltry average annual increase of under 0.20 per cent. Going further back to the decade of 1990s when the civilian leadership of the country alternated between PML (N) and PPP, the increase in Pakistan's HDI was 9.3% from 1990 to 2000, less than half of the HDI gain of 18.9% on Musharraf's watch from 2000 to 2007. Acceleration of HDI growth during Musharraf years was not an accident. Not only did Musharraf's policies accelerate economic growth, helped create 13 million new jobs, cut poverty in half and halved the country's total debt burden in the period from 2000 to 2007, his government also ensured significant investment and focus on education and health care. The annual budget for higher education increased from only Rs 500 million in 2000 to Rs 28 billion in 2008, to lay the foundations of the development of a strong knowledge economy, according to former education minister Dr. Ata ur Rehman. Student enrollment in universities increased from 270,000 to 900,000 and the number of universities and degree awarding institutions increased from 57 in 2000 to 137 by 2008. In 2011, a Pakistani government commission on education found that public funding for education has been cut from 2.5% of GDP in 2007 to just 1.5% - less than the annual subsidy given to the various PSUs including Pakistan Steel and PIA, both of which continue to sustain huge losses due to patronage-based hiring. What Prof Riaz ul Haq sb has ommitted to mention is even more significant, as usual. For instance, that while doing the survey, 736 Japanese firms in India had been surveyed of which 343 replied. By contrast in Pakiland, a grand total of 34 firms had been surveyed of which 27 had replied. Majumdar: "What Prof Riaz ul Haq sb has ommitted to mention is even more significant, as usual." Two infographics in the post show the number of responses from each country. And the source link is shared in the post for all readers to check out other details for themselves. ..."The total length of the railway line is expected to be 50km and will cost about $1.58bn." The execution of the project, however, is facing a few hurdles in land acquisition. Several households have been illegally living along the right of way of the proposed KCR. A resettlement action plan study was proposed to identify and provide land for the people affected by the project. Following completion of the study, the land needed for the project was to be transferred to the KUTC. The resettlement study, however, has not been completed, and therefore, the project can not yet begin. A feasibility study for the revival of the KCR was conducted by Japan External Trade Organisation (JETRO) in 2006. UK-based Scott Wilson Railways was appointed to validate the report prepared by JETRO. Japan International Co-operation Agency (JICA), which is funding the project, sponsored a final study prepared by Special Assistance for Project Formulation (SAPROF). US-based consultants Louis Berger validated the final report. The study prepared by JETRO recommended that the project should be executed in two phases. Phase I of the project will include a 28.3km circular section from Karachi Cantt to a proposed station at Gulistan-e-Johar. About 9km of this section will be elevated. Phase II will consist of the 14.8km circular section from Gulistan-e-Johar to the proposed station at Liaquatabad. This section will have two dedicated tracks along the main line. Phase II also includes a 5.9km airport line from Drigh Road to Jinnah Airport. This extension will either have an elevated or underground track. Other bridges, culverts and underpasses, wherever necessary, will be constructed for the project. Japan International Co-operation Agency (JICA) is providing the entire funding for the project through a soft loan. 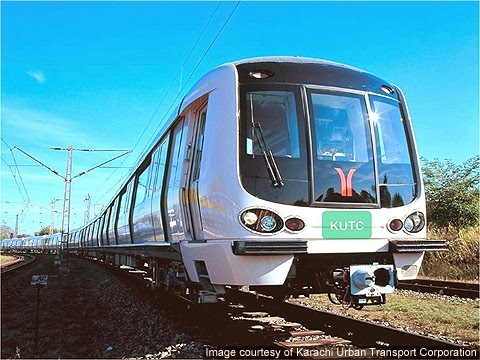 The loan is payable in 40 years by the stakeholders of the City District Government Karachi, Pakistan Railways and Government of Sindh (KUTC). The KUTC is planning an international tendering process for the project, which will be awarded on a turnkey basis. The winning contractors will operate it for the first two years of operation. The modernised KCR will follow a circular path, covering Karachi Cantt, Karachi city, Wazir mansion, Liaquatabad, Depot Hill, Drigh Road and Departure Yard. The extension towards the airport will start from Drigh Road and follow the path of the Pakistan Railways towards the airport. "About 23 stations are planned for the project." The project will include the construction of 19 underpasses and three overhead bridges. About 23 stations are planned for the project. The stations will feature computerised ticketing and vending machines, automated ticket gates and elevators. The existing KCR has about 22 level crossings. Since the railway line passes through the major commercial areas of the city, these level crossings need to be removed to ensure that trains can operate at the proposed 6min headway. The level crossings are expected to be removed and replaced by underpasses or overpasses. The new KCR will be served by electric multiple units (EMU) with a capacity to carry 1,400 passengers. The maximum speed of the EMUs will be 100km/h. About 290 trains are expected to operate daily at a six-minute headway. The corporate world’s fascination with Africa shows through clearly in the rates of change of sentiment, too. The data compare an average of corporate sentiment for year-to-date 2014 with an average of the results over the full-year 2013. Four of the five countries with the highest positive change in sentiment are in sub-Saharan Africa, as well as seven of the top 10. Pakistan, though, is ahead of the pack in terms of the number of companies newly taking an interest in it. Sentiment toward the South Asian nation of 183 million people improved by 5.6 percentage points, putting it ahead of Africa’s rising stars Nigeria and Kenya, which each saw sentiment improve by just over four percentage points. In absolute terms, though, Nigeria is still the clear leader among the three with twice the number of companies in the index considering investing there. Nearly three in 10 companies have Nigeria on their watch list. By contrast, Pakistan’s South Asian neighbors Bangladesh and Sri Lanka appear to be losing their appeal, with each seeing the number of companies focused on them slashed by more than half. Myanmar, which has only recently emerged as a potential destination for investment, saw a similar decline in corporate interest, with a meager 4% of companies including it in their watch list. Companies’ waning interest in Myanmar most likely reflects the realization among executives that the country is far from ready to receive significant foreign investment in most sectors. 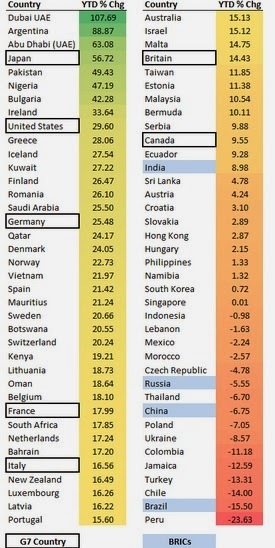 Not surprisingly, the country that saw the greatest decline in attention from multinationals was Ukraine, whose 12.5-point decline was almost double that of the next-worst performer, Oman. While financial investors have seen healthy returns from their high-risk bets on the tumultuous central European economy, businesses are looking elsewhere for long-term opportunities. Overall, sentiment toward frontier markets among the 200 or so multinationals included in the survey declined. All but 14 of the 70 countries covered in the survey have seen the level of corporate interest in them subside since last year. KARACHI: The long-awaited moment for the stock market arrived on Thursday when the KSE-100 index performed the incredible feat of crossing comfortably over the 30,000 points level. The ravaging bulls tossed the index up by 400.94 points or 1.35 per cent to 30,177.11. The volume also jumped 83pc over the previous day to 206 million shares. The immediate trigger for the bulls was provided by the global rating agency Moody’s upgrade of outlook for Pakistan’s economy to ‘stable’ from ‘negative’. It was sweetened further by the rating agency’s outlook on five Pakistan banks to ‘stable’ from ‘negative’. All five banks were major gainers on Thursday with ABL up by Rs5.87; HBL by Rs3.66; MCB by Rs5.41; NBP by Re0.69 and UBL by Rs8.35. Elsewhere, PSO rallied by Rs7.67 and Lucky Cement advanced by Rs15.93. Brokers said that cement shares were powered by expectations of healthy June results. Most market gurus admit that foreign investors have been the engine that drove the market to its all-time high. On Thursday, foreign funds bought equity worth $6.44m, which raises the total inflow to $33.7m only during the first three weeks of July. Khurram Schehzad, chief investment officer, Lakson Investments, pointed out that the Pakistan bourse had benefitted from increase in weight in the MSCI Frontier Market index which elated Pakistan to third place, after Kuwait and Nigeria. He observed that since January 2012 when the market first picked up momentum, foreign inflows into the Pakistan market amounted to the tall order of $826m. A perception survey conducted by the American Business Council showed that there was an improvement of over 30% in the law and order situation from 2015-16. Over 78% of respondents have indicated that they plan to invest in Pakistan over the next 12 months as compared to 65% in 2015 and 83% are optimistic about the long term economic climate. The members have however separately commented about the government’s tendency to introduce mini budgets as well as sudden changes in policies or rules during the course of a fiscal year. “Such steps negatively impact new as well as existing investments,” the members stated. The perception survey allowed ABC members to rate their satisfaction on various economic, regulatory and political factors that affect the performance and growth of businesses operating in Pakistan over 2015-16. The business climate was rated on each of the various factors influencing it, including implementation and consistency of trade and competition policies, government development budget, domestic market, internal and external political climate, and law and order. For 2015-16, the vast majority of respondents rated the business climate of Pakistan as satisfactory with only 8% giving it a poor rating. This is a marked improvement over 2014-15 when 11% of participants rated the business climate as poor. The overall positive perception of American investors reveals an expectation of some economic stability and an improvement in Pakistan’s economic environment. The participants were also asked to rate the performance of various ministries directly affecting the business climate. In this regard, the overall trend reflects a slight improvement in the performance of various ministries from last year. The Ministry of Petroleum and Natural Resource showed a marked improvement with 78% of participants reporting the performance as fair and 16% reporting it as poor. In 2014-15, 46% rated the performance of this ministry as fair and 51% rated it poorly. American Business Council of Pakistan President Sami Ahmed said, “Our members are positive and remain committed to Pakistan.” Ahmed added that international standing and perception is extremely important as Pakistan competes with other Asian players to attract foreign capital in the form of trade exports, human resources, and most importantly, direct foreign investment. The ABC is one of the largest investor groups in Pakistan with 67 members, most of whom represent Fortune 500 companies. They operate in various sectors including healthcare, financial services, information technology, chemicals & fertilizers, energy, FMCG, food & beverage, oil, and others. ABC members have cumulative revenues of US $4.0 billion. Their contribution to the National Exchequer, through direct/indirect taxes is approximately Rs 102 billion. They exported goods worth Rs 6.60 billion during 2015, and directly employ over 34,000 people, with 140,000 dependents, and indirectly employ approximately 1 million people through their networks of agents, distributors, contractors, etc. The ABC is affiliated with the Federation of Pakistan Chambers of Commerce & Industry (FPCCI) and is a member of the US Chamber of Commerce (USCC), Washington D C and the Asia-Pacific Council of American Chambers of Commerce (APCAC). ABC also has a close working relationship with the US-Pakistan Business Council, Washington, which is a component of the USCC.